We now have our own sparkly new website! Check out our full website here. Hi! I’m Nikki, a Mum of two. I’ve been working with children for the past 9 years and more recently I’ve become qualified in children’s yoga. I’ve been teaching yoga in the school where I work for the last 18 months as part of their PE curriculum and have been running an after-school Reception class since September. We also run classes during term-time in Bishops Tachbrook, Warwickshire. To ensure you don’t miss out on the latest news from Mind Over Matter Yoga please subscribe to our mailing list, here. Our sessions follow the Cosmic Kids class plans and I also create my own such as our ‘Room On The Broom’ afternoon. 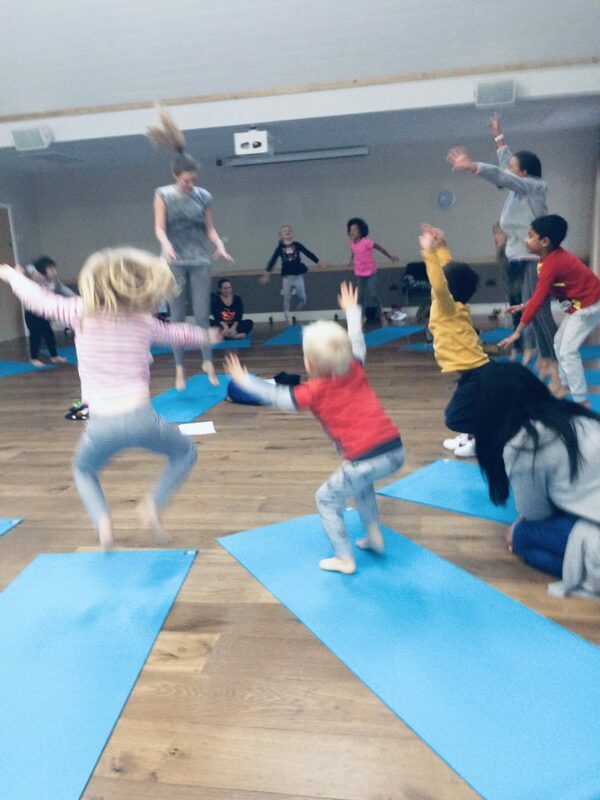 Our classes are story-led, allowing children to use their imagination & immerse themselves into the fun and creativity that yoga often inspires. I have had such amazing feedback from parents, who tell me that their children love showing them our ‘pose of the week’ at home and often practice at home too.The benefits of children’s yoga are endless and I could waffle on for hours about why I believe all children should have the opportunity to take part in a non-competitive activity which is inclusive. Yoga can enhance balance, core stability, calm the mind and body, improve self-confidence, health and of course it is FUN. Yoga really is a skill for life & I know that if we teach our children techniques for breathing, managing stress and building friendships early on, we can have a positive effect on their futures. So… here’s all the details! at St Chad’s Centre, Bishops Tachbrook. If there is enough demand for a pre-school and parents class I am happy to provide this 2-2:45pm on the same day so please get in touch to be added to a wait-list for this. Email us here to book your child’s space. Please like my Facebook page or our Instagram page here to join us on our journey & see some photos of our ‘Room On The Broom’ inspired class below. How many activities can you do with your child to really connect? Look into each others eyes, enjoy time together without phones and in relaxing comfortable surroundings. This Mother’s Day give yourself and your little one the chance to enjoy something together. Treat yourselves to the gift of time. The cost of our Mother’s day Mini Retreat is £15, this includes a space for both you & your child and a memento to take away. 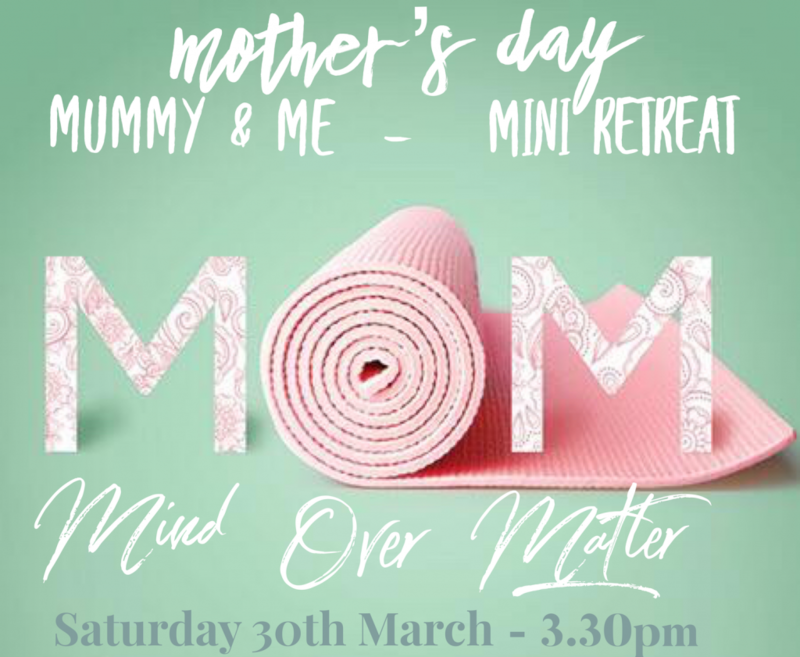 A Mummy & Me Yoga Session (mats provided) and relaxation session with aromatherapy (optional) and a drink for both of you. Please wear comfy clothes, bring a blanket and a cushion or pillow for each of you. I hope it will be the perfect start to your Mother’s day and I hope you will leave feeling relaxed and connected with your little one. This is suitable for one adult and one child due to the nature of this session.